This lead generator pulled a 26% response and helped publisher Drummond Designs reach active buyers of custom home plans. This direct mail package appealed to attorneys who depend on time-critical information for success in the courtroom. 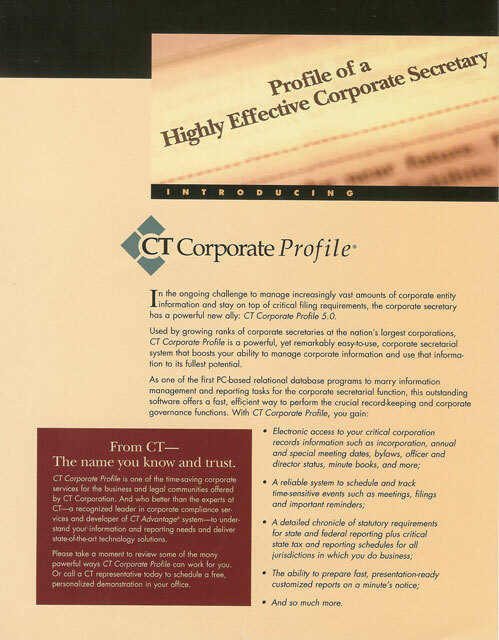 This six-panel corporate identity brochure establishes CT Corporation as the safe and logical choice to handle your complex legal and business transactions. I provided copy and design input to give Snappy Solutions a fresh, new website that reflects its extensive product line and green consulting services. I helped this Northern New Jersey real estate firm launch its website by interviewing officers of the company and synthesizing the information in a single, cogent voice. This employee education campaign encouraged Sanofi Aventis staff to rein in travel costs by utilizing their in-house corporate travel department. "Holy Name Hospital Celebrates Opening of Emergency Care Center,” Commerce Magazine, December 2008. I cover newsworthy events, like this breakfast with EPA Administrator Lisa Jackson, on the New Jersey environmental business landscape as well as general business topics.